Oh how I am loving a bit of leo at the moment! Moving on......now back to my new kicks! The inspiration for these was courtesy of my new favourite source the super stylish V from AMothersEdit blog and Instagram feed. 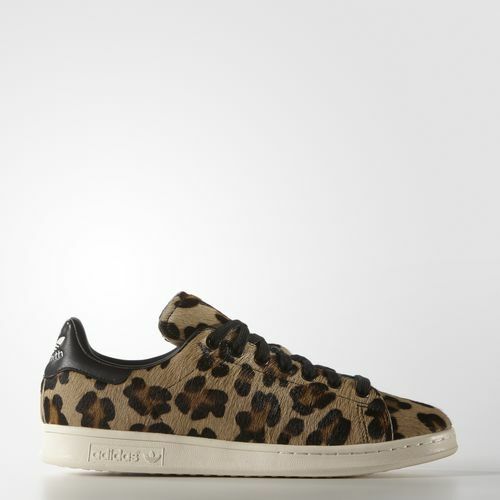 She featured these Adidas Originals leopard print Stan Smith's a few weeks back, she mentioned at the time they were sold out. Anyway cue some serious internet stalking I managed to find a men's size 6 from Size? all gone in smaller sizes now but you can get them here! I did fret about not being able to secure a pair of these so I had a contingency plan and was ready to order these Superga here but I had really set my heart on the Stan's. So I am well happy I managed to snap them up! I adore them. In case you are wondering, there is a difference in the men's sizing, they do come up a bit bigger but as they are lace up it's manageable. These are actually a damn size more comfortable than my original pair that are a women's size 6. These newbies have already slotted seamlessly into my winter wardrobe.....breathing a much needed bit of new life into outfits that seem to be on repeat. As I'm sat here at my laptop the sun is streaming in and although it is truly Ugg weather outside the brightness is helping to visualise how I'll be wearing my new Stan's come spring.....dare I even mention summer?! 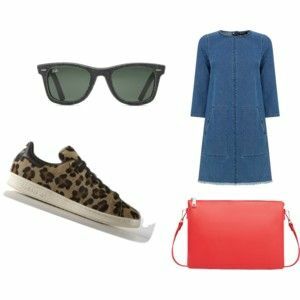 In my head I've been shopping my wardrobe mainly of past season clothing and accessories but with a some of the things I've bought recently with spring in mind. First of all I'm really looking forward to get my Topshop flowy trench out again this year (Toppers don't have anything similar but Mango do!) and I've been having fun mixing up my patterns recently and I especially love a stripes and leo combo! Next up is an ensemble featuring one of my favourite colour combos.....khali and grey! Last but not least.....my new Warehouse denim dress will look brilliant with the new kicks! This lovely red Mango bag is on my wish list now! I'm sure there are endless possibilities for my sneakers, these are just a few ideas off the top of my head....I really going to enjoy styling these with the rest of my wardrobe too! Have you found your ideal footwear for spring yet? I'd love to hear! Outfit round-up for this week! So ladies....which is your preference? Leo in the clothing/shoes/accessories sense or our gorgeous Mr DiCaprio? ;0) Me? I love both! Be back soon....bringing you a bit of colour I hope! As you know Michelle I love incorporating leopard print into my outfits & your new trainers are fab - bet you're going to wonder how you managed without them! Ahh yes Jane....your love for leo is well documented! ;0) I seem to be going crazy for any kind of print at the moment leo, stripe, check, camo and even a bit of flower power! But I do adore my new kicks and I am certain I will wonder what I did without them! Oh no Michelle what have you done to us....showing those fab kicks then saying they are sold out!! Ah well I shall just have to enjoy seeing you in yours and each time kick myself for not spotting them sooner!! Love how you are going to style them too...Super cool and stylish! Now off to sulk!! They still have them in all sizes last time I looked! I hate it when things sell out but there is hope for these still! Love the kicks, only slight snag is my 10-year has an unbelievably similar pair from John Lewis. Would the mother/daughter dressing be too much I ask?!! These are great - honestly can't see many men going in for leopard prints shoes though so I assumed these were women's until I read your post just now. Nuts! Great buy though, well done!